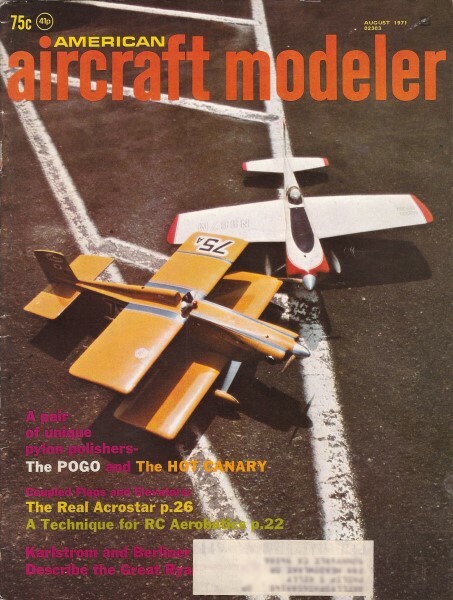 The article was scanned from the August 1971 American Aircraft Modeler (page 29). It has been out of print for decades, and is difficult to access unless you are fortunate enough to buy one off of e-Bay. Hopefully the original author won't mind that I have reproduced it here, but if he does, I will remove it. This is a very cleverly written article by Mr. John G. Burdick, and believe it or not, there were some very unflattering - even angry - letters to the editor in the following months. There is one slightly nuanced feature that depends on the reader being familiar with the meaning of complex numbers (those with both a real part and an imaginary part). If you look at the graph in Figure 2, you will see in the caption that the scales have been multiplied by a factor of √-1. According to what most people have been taught, one cannot take the square root of a negative number. That is because if you take the result of a square root and multiply it by itself, you should end up with your original number; e.g., √4 = 2, so 2 * 2 = 4. That's good. Why go to that trouble to explain imaginary numbers? Look at the Figure 2 graph again. If the torque and power scales are multiplied by √-1, that means the numbers are all "imaginary;" not real! As I said, lots of people didn't get that part of it, and wrote to condemn Mr. Burdick for being ignorant. The irony is great! Fig. 1 - Cutaway view of ZDE engine shows low engine height possible only with Zero Stroke design. Low compression ratio (0.00 to 1) permits use of No-Lead fuels. Fig. 2 - Predicted performance curves of ZDE. Torque is essentially constant throughout RPM range. Power does not peak as with non-conventional engines. For convenience in representation, Torque and Power scales shown have been multiplied by a factor of √-1. The specific power output of miniature aircraft engines has shown a remarkable increase since the days of the Browns and Baby Cyclones. Probably the invention of the replaceable glow plug was the most important of several technological factors contributing to this increase, but advances in metallurgy, fuel chemistry and engine design have also been contributory. Power=Ad + Bd + C (where d equals displacement). A startling result emerged - C was not equal to zero! In non-mathematical terms, this simply means that it should be possible to construct a miniature engine having zero displacement but greater than zero power output. This conclusion, while certainly surprising, is not altogether so; only a few years ago the present 01 and 02 engines would have been regarded as impossible. Given that a ZDE is theoretically possible, the remainder of this paper will concern itself with the possible configurations and applications of such an engine. Design of the ZDE: Since the product of two numbers is zero if either is zero, zero displacement might be obtained through the choice either of zero stroke or zero bore. Practical considerations, primarily the production problems inherent in manufacturing a piston of zero diameter, suggest the choice of zero stroke rather than zero bore for the ZDE. While this would definitely be counter to the current practice of square or over-square design (that is, the bore-stroke ratio would be considerably smaller than usual). it is felt that the advantages to be gained would outweigh this disadvantage. Specifically, some of the advantages would be as follows. (1) Existing small engine designs could be easily modified into the ZDE by proper crankshaft design: that is, with the crankpin coaxial 'with the shaft proper. Provision for fuel induction would be similar to current practice, except that the crankpin itself would be hollow. (2) Engine life should be relatively great since even at high rpm's linear piston speed would be low. (3) Very little dynamic crankshaft counterbalancing would be required. Note that factors (2) and (3) taken together suggest that a very high operating rpm would be feasible, perhaps in the 55,000-65,000 range. Application of the ZDE: A reasonable estimate of the power output of the ZDE may be obtained, if proper units are chosen, from the value of the constant C mentioned above. This turns out to be about 0.025 hp, although the high operating rpm mentioned earlier might lead to a somewhat greater power output. Since power outputs of this order would seem ideal for indoor Re, discussion will be confined to this application. Current RC power loading parameters suggest a weight of about six ounces as optimum for an aircraft utilizing the ZDE. The recent development of extremely light radios suggest that this is a practical figure and one which could be attained, or only slightly exceeded, by careful construction technique. Certainly, the requirement for high-lift surfaces which would lead to good low-speed performance, a primary requirement in indoor RC, would also lead to the ability to tolerate a considerably higher power loading than usual. A hypothetical design suitable for indoor ZDE-powered RC includes these design features: a scale-like jet fuselage, necessary since the very high operating rpm of the ZDE, plus its predictably low torque, would seem to dictate a shrouded propeller or ducted fan design. The canopy provides room for the radio gear, since the cone necessary for ducted fan operation would occupy most of the fuselage interior. The biplane design, utilizing a high camber airfoil, would provide lift enough for good low-speed flight as well as compensate for the possible high power loading. Finally, the counterbalanced control surfaces were chosen to reduce actuator loads. Conclusion: Several useful purposes would be served by the development of the ZDE, primarily as a power unit for indoor RC and perhaps for indoor free-flight as well. It is hoped that some manufacturer will. in the near future, consider making such an engine available to model builders.